Cramer's new AT Fanny Pack kit is perfect for someone who wants to carry a lot, but not wear a lot. Only the AT Fanny Pack features a removable strap and sewn-in belt clips so you can wear it on your pants, with or without your own belt. 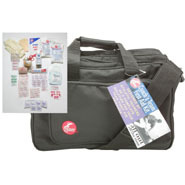 Mandy versatile bag allows storage for special items in an easy to see clear zippered bag. Fuits easily into most kits for organized take-alongs. Available in two sizes. 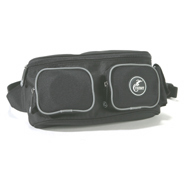 Over-sized fanny pack is great when you need more room, yet retains same comfortable fit as smaller packs. 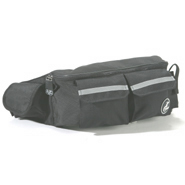 Features quick access pockets, a tape pocket and a detachable module. PACK MEASUREMENTS 11.25" x 5.75" x 5.5"
Rubberized bottom and feet for improved resistance to wet conditions on the field. 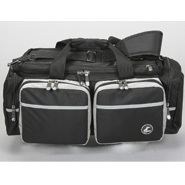 Padded sides and lid for improved protection of supplies and equipment. Removable rigid dividers allow for custom organization of the interior of the kit. Measures 21.25" x 12" x 12.5"